It’s only natural that you want everything to be exactly the way you want it on your wedding day. 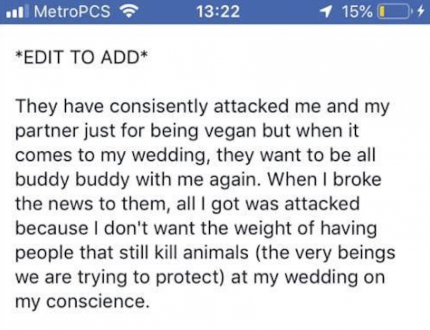 And this vegan bride appears to have taken that ambition to the extreme by uninviting her family from her big day because they eat meat. 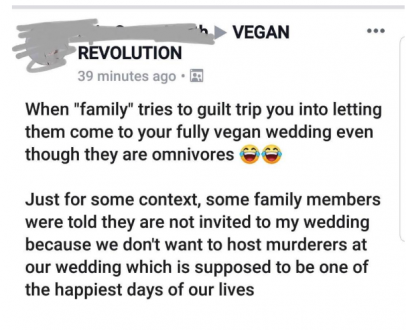 Apparently the bride and her groom didn’t want to host ‘murderers’ and the bridal party was later banned as well. We know this – at least, we think we do – because she wrote about it on Facebook in posts which were later shared on Reddit. 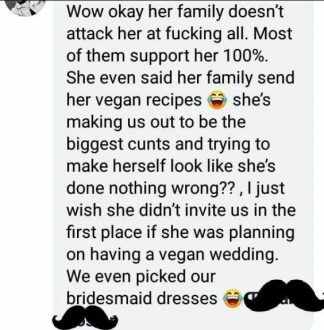 And to make matters worse (actually, we mean better) a bunch of bridesmaids and other people who were uninvited weighed in. Here’s a few of the things they had to say. So it’s fair to say that feelings were running high. 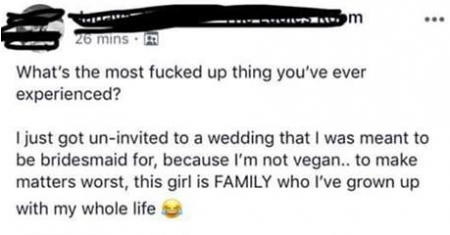 So high, in fact, that the bride felt compelled to explain what had happened. Not sure it helped, though. 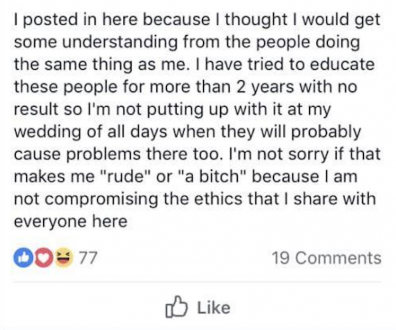 The waters were muddied even further when a bridesmaid said this. And these comments pretty much sum up what people were saying about it Reddit.